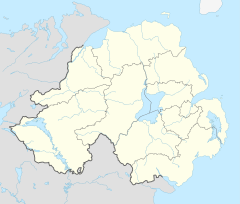 Killeter (from Irish: Coill Íochtair, meaning "lower wood") is a small village and townland near Castlederg in County Tyrone, Northern Ireland. In the 2001 Census it had a population of 147. Killeter has a yearly August fair, which celebrates the diversity and richness of rural life. The village itself sits along an ancient pilgrimage trail which winds its way to Lough Derg. The national cycle network traverses part of this trail, which is bounded to the west by Killeter Forest. The writer Benedict Kiely has stated that he based the fictional village of Carmincross, in his novel Nothing Happens in Carmincross, on Killeter. Near Killeter is the Magherakeel historical site with its holy well, lime kiln and ruins of an early church. The Magherakeel Monastic Site along the Lower Strabane Road, near Castlederg, was one of Ireland's most important ecclesiastical centres. The monastic site dates from the 6th century with only a small part of wall remaining from St Caireall’s church. Saint Patrick’s Well, Killeter, is a well that legend says St Patrick stopped at to drink from after leaving Lough Derg. On 29 April 1844, a shower of Meteoric Stones fell, in the sight of several people, at Killeter; they were broken into small fragments and only one piece was found whole. Wikimedia Commons has media related to Killeter. ^ "Placenames NI". Archived from the original on 2012-06-11. Retrieved 2011-01-19. ^ "Killeter". NI Neighbourhood Information System, Gazeteer of Settlements. Retrieved 16 January 2011. ^ a b "Destinations - UK - Ireland". Touring Tyrone. Retrieved 16 January 2011.